Robert Kotick is the CEO, president, and board member for Activision/Blizzard, a position he assumed after the Activision Blizzard merger in July 2008. 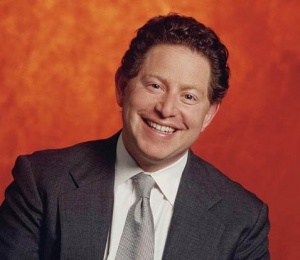 Prior to that Kotick had been the CEO of Activision since February 1991. Kotick is a businessman and an admitted non-gamer, and he has earned a reputation as being focused exclusively on the bottom line, with a desire to bring standard bean-counting business practices to the free-wheeling, fun-infused game development industry. There were concerns in the gaming community when Activision bought/merged with Blizzard, since Kotick's oft-stated business philosophies seemed to be in direct contradiction to Blizzard's slow, careful, quality-first design practices. Blizzard's heads assured fans that there would be no management changes at Blizzard and no influence or interference from Activision leadership, and so far there's been no obvious evidence of Activision interference. Fans remain concerned though, since for all the grumbling heard about Blizzard's slow development pace and frequent delays, the prospect of them rushing games and sacrificing quality to meet corporate timelines is a much scarier proposition. Some members of the press openly criticize Kotick. Ars Technica editor Ben Kuchera wrote, "Kotick doesn't play his games, and it shows." As far as is publicly known, Bobby Kotick has had zero input or involvement in the production of any Blizzard games, Diablo III included. Bobby's not a gamer and not a game designer, and he knows enough not to meddle and risk killing the golden goose. His input, if it came, would be in terms of faster development, cutting costs, or marketing and distribution expertise. Diablo III Game Director Jay Wilson was asked about his experience with Activision in an interview from Gamescom, in August 2010. Jay Wilson: The only experience I’ve had has all been positive. Activision has really good distribution. It’s a business-y thing, but their distribution channels are great. Really helped with the launch of SC2. I’ve never had any Activision person ask me to do anything. Or ask any of the other game directors at Blizzard to do anything. We make really good games and they respect that. and they do very good distribution and publishing, and we respect that. A lot of the speculation about we’re being pressured to do this or that, or Bobby’s twisting their arm... if it’s happening I’ve never seen it. A fair answer, but note that Jay limited his comments to actual game production issues. He didn't include B.net changes or features, such as the Real ID/real names in the B.net forums debacle. Diablo fansite Diablo.Incgamers.com started a meme in late 2010 by posting a tiny, tightly-cropped image of Bobby's Eyes in any news item about Blizzard financial issues, Blizzard game piracy, or other such topics. The intended allusion is a cross between Big Brother and Ceiling Cat. Most fans seem to find the meme amusing. Jay's eyes joined Bobby's as a joke/meme, in early 2011. To the surprise of nearly everyone, Bobby Kotick plays a small role in the film adaptation of Michael Lewis' book, Moneyball. News of this spread in June 2011, when Bobby, or someone most people assumed just happened to look a lot like him, was seen in the movie's trailer. Activision PR soon confirmed that it was indeed Mr. Kotick, while declining to provide any additional details about the production. Naturally fan-made LOL images proliferated, one of which can be seen below, beside the Moneyball trailer. Bobby Kotick appears briefly at 18 seconds. 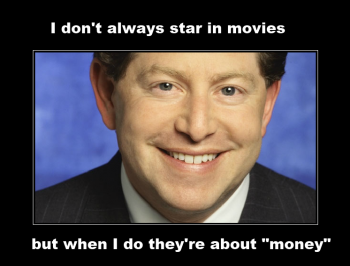 Kotick has been covered extensively in the press. The articles vary greatly in their focus and approval of his actions and philosophies. See all Diablo III news items with a Bobby Kotick connection on Diii.net. Forbes offered fluffing praise from the business community. On the other hand, an Ars Technica piece burns with demonic hatred. A more balanced piece from Little Bo Beep takes a sarcastic approach, defending his actions in the larger scheme of things. A new, allegedly more patient and sensitive Bobby talks to Gamasutra about the benefits of lengthy Blizzard beta tests. This page was last edited on 17 November 2012, at 21:25.